There’s a not-so-secret trick to committing to your yoga practice every damn day. I believe life is like a yoga practice, and the same trick has become an essential life lesson that’s saved me every time I felt like giving up. The beautiful thing about yoga is you can step on your mat exactly as you are, full of joy or bursting with tears, and there are poses, breathwork and a safe space ready to support you. You don’t have to wait until you have the latest yoga pants or can balance on one arm to get on your mat. And you don’t have to wait for a basket of rainbows to land on your doorstep to live your life. Please don’t!! It just doesn’t work that way. Life will pass you by if you sit around waiting for the perfect moment. You can craft vision boards and say words of affirmations in the mirror every morning for years, but reaching your dreams ultimately happens by putting in the work every single day. Even on the days when everything falls apart. Still then, and maybe most importantly then, no matter how exhausted or broken your body or heart feel, you must show up for yourself and your life. No matter the circumstances, it’s up to you to move your mind, body and soul forward. This is the lesson I’ve learned over and over again right there on my yoga mat. The lesson is to modify. This was the view from my mat this morning. I stubbed my toe on a rock yesterday. Even though it’s a tiny wound, it affected my practice immensely. 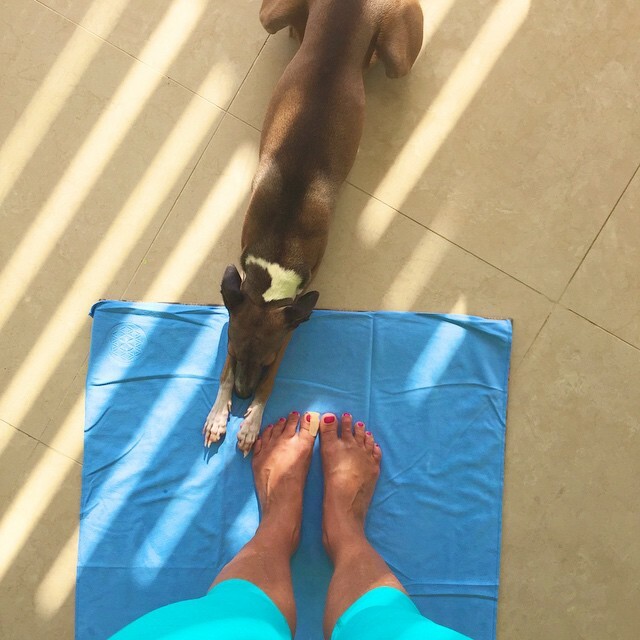 Yoga is hard when you can’t roll over your toes—Chaturanga to Upward Facing Dog was impossible and anything with tucked toes, even Frog pose, became tricky. So, I modified. Like I always do. I modified my practice when my back pain was so intense I could barely get out of bed. I modified when I had abdominal surgery and couldn’t stand up straight for weeks. I modified when my Pepper died and I was so angry with myself I didn’t even have the guts to get on my mat. I modified when I hurt my shoulder, my neck, my knee. I modified when life broke my heart. Essentially, it’s what this practice is—taking what life’s brought you today and adapting to make it work. To move forward. To grow. To learn. Showing up for your life when the odds are stacked against you is where the real work begins, and where the real magic is found. It’s where you meet your strength, your creativity, your resiliency and your faith. Where better to practice this skill than in your safe space, on your yoga mat? Today the challenge was a tiny cut on my right big toe. So, I skipped my jump backs but added plenty of handstands and core work. It turned into one of the sweatiest 90-minute sessions I’ve had in a long time! Modify. Adapt. But never, ever give up. Don’t forget, you can practice showing up for your life, on your yoga mat, with me and some of the most badass guides there are here and over on oneOeight.com. How have you had to adapt your yoga practice? What did it show you about yourself? Share with me in the comments below!